Where we tell you our aims for this section. Frances Wright was born in 1795 in Scotland but had an early interest in America. After educating herself from a college library, she visited the United States when she was 23. During her travels, she wrote Views of Society and Manners in America. This travelogue hails American life as progressive in contrast to the backwardness of the Old World. Mary Lyon was born on February 28, 1797, in Buckland, Massachusetts. She started teaching school in 1814. Whistle-stopping in 1948, President Harry Truman often ended his campaign talk by introducing his wife as "the Boss" and his daughter, Margaret, as "the Boss's Boss," and they smiled and waved as the train picked up steam. Flora was a heroine to Prince Charles Stewart but also to many highlanders. The 1st wife (though never queen) of Robert II, is a shadowy figure of whom little is known. Mary Seton was the only one of the Maries not to marry. She remained in service to the queen and shared her captivity in England for 15 years. She was called Beaton because it rhymed with Seton. The Beatons of Fife were one of the most powerful clans in Scotland in the 16th century. There has always been a fascination about Mary Stuart, Queen of Scots. Her life has been romanticized in novels and in the movies. However, the story of Mary is a great tragedy in history. Margaret Tudor was the first daughter born to Henry VII and Elizabeth of York. She was married to James IV of Scotland on 8 August, 1503 at Holyrood House. Countess of Nithsdale, d. at Rome, May, 1749. She was the daughter of William, first Marquis of Powis, who followed James II into exile. She is famous in history for the heroic deliverance of her husband from the Tower on 23 Feb., 1716. She is the youngest of six children (two brothers -- Robert and Alex and three sisters -- Marilyn, Annessa, and Morag). Underwent formal vocal training before launching her career in 1979 with EMI Records. Her eponymous 1981 debut album spawned several U.K. Top 10 singles, while in the U.S. "Morning Train" reached No. 1, lifting Sheena Easton into the Top 30. The Fourth Earl, Charles, married the beautiful daughter of the Fourth Earl of Nithsdale, Lady Mary Maxwell (see Caerlaverock Castle, and the new biography mentioned below). She bore 17 children between 1695 an 1711. In the winter of 1715 her sister-in-law, Lady Nithsdale, rode to London where she successfully organised Charles's escape from the notorious Tower where he had been sentenced to death for his part in the Jacobite Rising. Mary became one of the leading minds in mathematics and physical science. She published several books demonstrating her exceptional grasp of the science. Mary decided to pursue a career instead, and in 1903 moved to London where she became Secretary of the Women's Trade Union League. On 23rd December, 1909, the newspaper of the Women's Freedom League, The Vote, wrote an account of how Cicely Hamilton and Bessie Hatton formed the Women Writers Suffrage League. Rachel and Margaret helped the workers during the London Dock Strike. The continued to be involved in spreading the word of Christian Socialism to industrial workers. Only daughter of John A. Stewart, a founder-member of The Stewart Society. Josephine Tey is a pseudonym of Elizabeth Mackintosh, b. 1896, Inverness, Scotland; d. 1952, London. This great actress was born in London in 1932. She was the daughter of an Art dealer that is of Scottish Descent that lived in Kansas City Missouri. Elizabeth's mother was a Rosemond, also of American-Scots descent. The Mark of the Scots has this famous painter listed as an American Scot. She opened her first beauty salon in New York in 1907, forming the cornerstone of an international empire of salons, beauty products, and chic image. Elizabeth was a Canadian Scot. She was born in Sydney, Australia on 7 November 1926; of Australian Scots ancestry. Her mother taught her until she was nineteen, when she trained formally in Sydney with John and Aida Dickens. She sang in concerts, oratorios and broadcasts throughout Australia. Lady Nairne was an astute collector of song and wrote some of Scotland's best-known songs, yet today there are few people that are familiar with her work. It doesn't help that some of her songs and prose have have been attributed to Robert Burns, James Hogg or Walter Scott. Margaret at last consented to be wed, and when the first primroses were beginning to star the woods, and spring hastened to breathe a softer welcome to the English bride, the royal marriage took place at Dunfermline in the happy Eastertide. Kenneth MacAlpin, King of the Scots and Pics united the two races. According to MacAlpin's law of Tanistry, the Kings of Scotland were to marry the Pictish princesses whom held the lands of Scotland. The First Born daughter princess was intended to inherit her father's estate. This was not the case in Lady MacBeth's case. The 1930's are very often seen as the `historical period' of Modern American Dance. In these years modern theatre dance came to be accepted as an art form. There are a few pioneers in modern dance at the beginning of the century. Of them, dancer and choreographer Martha Graham had the most lasting influence. Juliette Gordon Low, second generation Scot, founder of Girl Scouts in the United States. Marjory Bruce, Princess of Scotland, was the only child of the 1st marriage of Robert I, The Bruce. 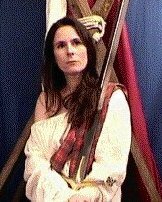 She was born probably in December 1296, the same eventful month that Edward I of England, the self-styled 'Hammer of the Scots', invaded Scotland and laid siege to Berwick. The 2nd wife and only queen of Robert II, was the daughter of Hugh de Ross, 4th Earl of Ross. She was probably born between about 1325 and 1330, but this is very uncertain. This Mary's ancestry was not only noble but royal as well. James IV was her grandfather, as well as Mary Stuart's grandfather. She was very robust and athletic and the others called her Lust. Her father was one of Mary Stuart's guardians and sailed wither her to France. 151560, queen consort of James V of Scotland and regent for her daughter, Mary Queen of Scots. Her Majesty Queen Elizabeth The Queen Mother is the mother of Queen Elizabeth II, the present British sovereign, and the widow of the late King George VI. An Early Benevolent Ladies Group for Scotland and N. England is founded. In 1978 Winifred, now 93, was instrumental in setting up the Wellspring as a successor to the Davidson Clinic. Helen Fraser was born into a Scottish aristocratic family in 1879. Educated at Cheltenham Ladies College her parents were shocked when she asked to study science at university. Lee was appointed arts minister and was responsible for what Harold Wilson later called the greatest achievement of his Labour Government, the setting up of the Open University. Elizabeth de Burgh was the daughter of Richard de Burgh the powerful Earl of Ulster a close friend of Edward I king of England. In 1908 she became the first woman to plead before the House of Lords when she advocated that women graduates should be given the vote. Isabella was born to the tenth Earl of Mar, Lord Donald MacGylocher and Helen of Wales. Isabella was a wealthy young woman at the time of her marriage to Robert Bruce the Earl of Carrick. Her lands were most of the northeastern section of Inverness. The haunting story of the Scottish-Hawaiian Princess Victoria Kaiulani; the fragile beauty who, as heir-apparent was groomed all her life to be the future Queen of Hawaii. Born as Norma Jeane Mortenson on June 1, 1926 in Los Angeles General Hospital, her mother, Gladys, listed the fathers address as unknown. Marilyn would never know the true identity of her father. Duncan Bruce that states that her Mother's side was Monroe from Scotland and related to President Monroe. 1948. McAuliffe is from Ulster Scot descent. Her goal as the first teacher in space was to "humanize the Space Age by giving a perspective from a non-Astronaut." Katharine Hepburn was born in 1907 in Hartford, Connecticut. Her father was a doctor and the family was very well off financially. Dr. Hepburn was a direct descendent of James Hepburn 4th Earl of Boswell. Letters of a Woman Homesteader. Poet and author of "TO THE COUNTESS OF LOUDOUN"
My father's ancestors were the Shaws of Rothiemurchus, in Scotland, and the ruins of their castle may still be seen on the island of Loch-an-Eilan, in the northern Highlands. By the time of her death, Margaret Oliphant had produced over 100 novels, almost 30 works of non-fiction and other articles for Blackwood's Magazine. The entire household had worked for days to prepare for the Thursday evening in 1853 when Mittie Bulloch, the youngest daughter in the family, married Theodore Roosevelt of New York City. This is a link to an archive of "The Canadian journal of Lady Aberdeen, 1893-1898". Aberdeen and Temair, Ishbel Gordon, Marchioness of, 1857-1939. From the moment she stepped on to the stage, at the Edinburgh Empire the diminutive singer was eager to please and was quick to tell the audience she felt at home in Scotland and that her Grandfather's people were called Milne originally from Aberdeen. A brave person who got a pardon from the King for her sister. Here we list some of Scotland's most significant female song writers. Lady Grizel Baillie, Miss Alison Rutherford, Miss Jean Elliot, Lady Anne Lindsay and Caroline, Baroness Nairne. The Pioneer Missionary of Calabar. Team leader of Scotland's Gold medal Curling team at the Salt Lake City Winter Olympics in 2002. Margaret Wilson and Lady Grizel Baillie. A great singer and actress. The author of the Harry Potter books. Ministered to the stricken people in Serbia. Lady Culross, the daughter of the statesman and courtier Sir James Melville of Halhill, was a fervent religious radical who died in 1640. Scotland first woman Ship Captain. SHE'S a Bollywood actress, a high-flying lawyer and is now bidding to be the first Asian MEP for Scotland. One of the most important collectors and popularisers of Gaelic song at the turn of the nineteenth and twentieth centuries.